Niall Sludden notched the opening goal of the game. AS OPENING STATEMENTS go, this was a powerful one issued by Tyrone this evening. They dismissed Roscommon in their first Group 2 match, a second-half scoring spree helping them turn a seven-point interval advantage into an 18-point full-time victory. 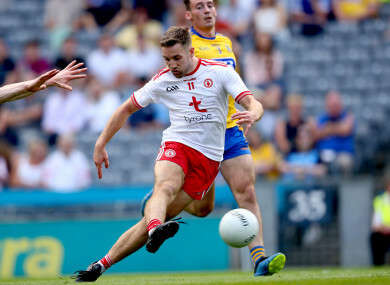 Tyrone were hit a setback when Enda Smith galloped clear for an early second-half goal for Roscommon and a point shortly after from Diarmuid Murtagh from a free left Kevin McStay’s men 1-12 to 1-8 adrift. But that was as promising as the outlook got for them. Tyrone accelerated clear on the scoreboard as they hit the net three times in the second half courtesy of a calmly despatched shot from Conor Meyler, an expertly-taken Peter Harte penalty and a palmed effort deep in injury-time from Richard Donnelly. It was impressive stuff from Tyrone who found Roscommon sticky opponents to deal with early on as the Murtagh brothers landed points. Niall Sludden pounced for a crucial score in the 11th minute when he drilled home Tyrone’s goal and they hit the final six points of the half after the 24th minute to go in at the break 1-10 to 0-6 in front. Roscommon threatened to make a fight of it at the start of the second half before Tyrone took charge. Captain Ciaráin Murtagh stuck home a lovely second goal for Roscommon but it ended up a chastening experience as they found Tyrone difficult to break down. Tyrone finished with 13 players contributing on the scoresheet, Richard Donnelly and Niall Sludden especially prominent from open play in that regard. Next up it’s Dublin in Omagh for Tyrone. They’ll look forward to that challenge. Roscommon must try to pick themselves up as they get set to entertain Donegal in Dr Hyde Park. Scorers for Tyrone: Richard Donnelly 1-4, Peter Harte 1-3 (1-0 pen, 0-3f), Connor McAliskey 0-4 (0-3f), Niall Sludden 1-2, Conor Meyler 1-1, Cathal McShane, Mark Bradley 0-2 each, Rory Brennan, Declan McClure, Matthew Donnelly, Tiarnan McCann, Michael McNamee, Ronan McNamee 0-1 each. Scorers for Roscommon: Ciaráin Murtagh 1-3 (0-2f), Diarmuid Murtagh 0-5 (0-4f), Enda Smith 1-0, Fintan Cregg, Conor Devaney, Conor Daly, Padraig Kelly 0-1 each. Email “Tyrone hit 4 goals past Roscommon and get off to flying start with 18-point win”. Feedback on “Tyrone hit 4 goals past Roscommon and get off to flying start with 18-point win”.